We had 10 metre visibility, lots of air, and got a nice swim through with lots of crabs. Even did the side cave too. 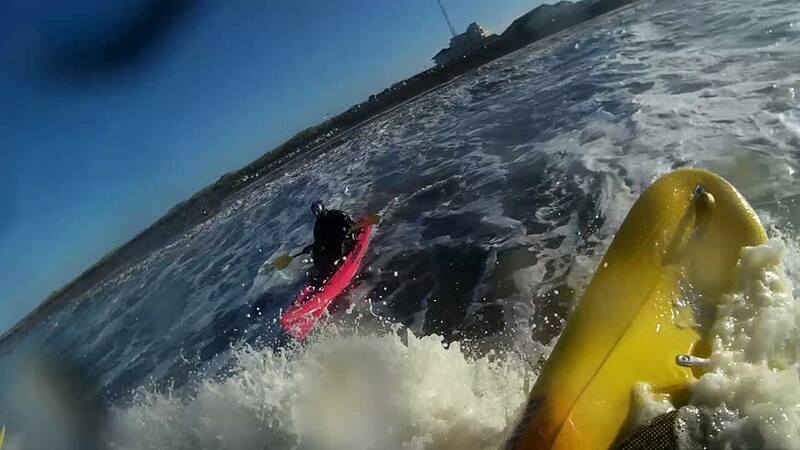 As Becka’s neckseal had split, I dived the Glenocum wreck on my own on the way back. It was so relaxing. 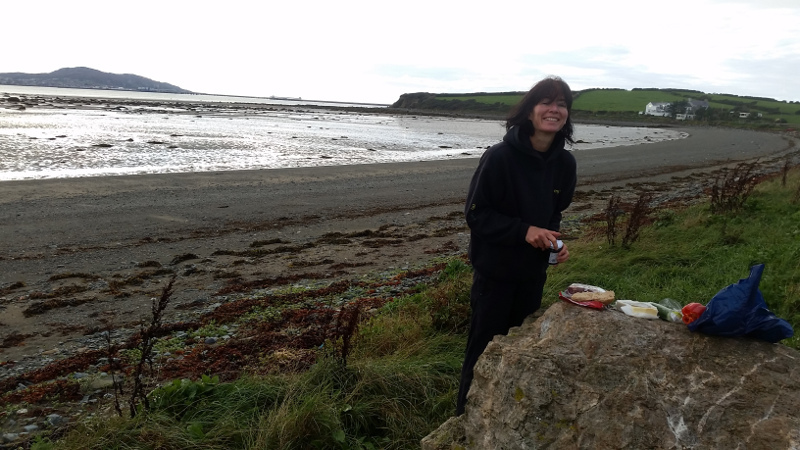 On day two we did some (very cold) snorkeling off Criccieth looking for seagrass (didn’t find any pipefish). On day three we were going to paddle around from Whistling Sands through Bardsey Sound, but decided that would be too scary, so we went and played in the overfalls by Nefyn. The waves looked huge when we were there, but don’t amount to much in the photos. We got air fills at Tyn Rhos Diving which surprisingly still existed. And beforehand I visited my mum for one night in Machynlleth before driving up for a night in the campsite behind Eric Jones Cafe and meeting Becka off the bus in Tremadoc, after much protesting that I didn’t want to drive up and fetch her from Caernarfon ridiculously late in the night. I was happy because I was not at Bull Pot Farm, and I totally ignored the New Year celebrations because I was tired and sleepy, though the cathedral bells and the fireworks disturbed me. Going again now, still with notably sore biceps. Hopefully the waves are a little less harsh. They roll in a little too frequently on that beach. Maybe I’ve got writer’s block. I’ve not even filled these into my logbook. I call it a hat-trick if I do a cave trip, a hang-glider flight and a dive in the same week. This is the fourth time I’ve done it. Generally speaking, the individual events are not all the greatest: the dive was pretty murky, the cave was gritty, and the flight was ridgy. Can’t complain. 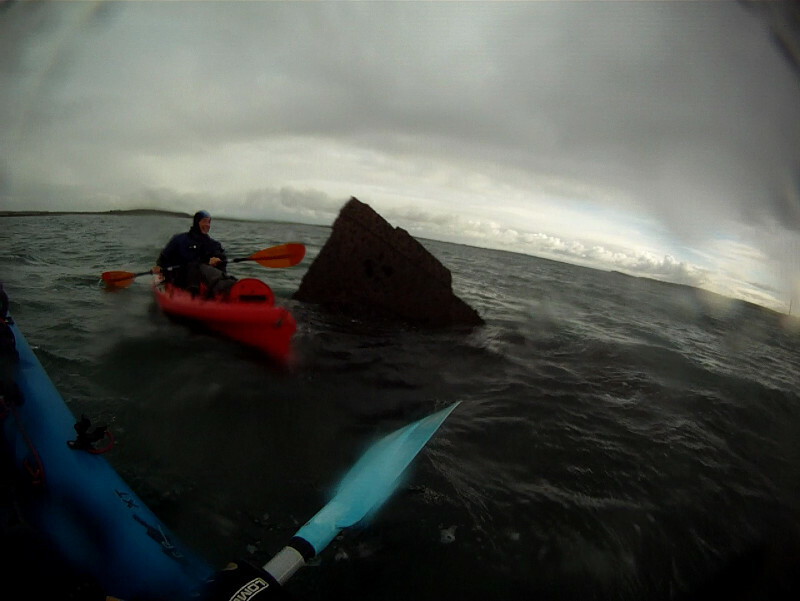 The wreck of the Azmund is in Holyhead harbour about a mile of paddling out from the beach. It was dark and murky and we didn’t find the way back to the boilers after starting on it. The wreck is huge though. Part of the metal juts out of water at low tide. 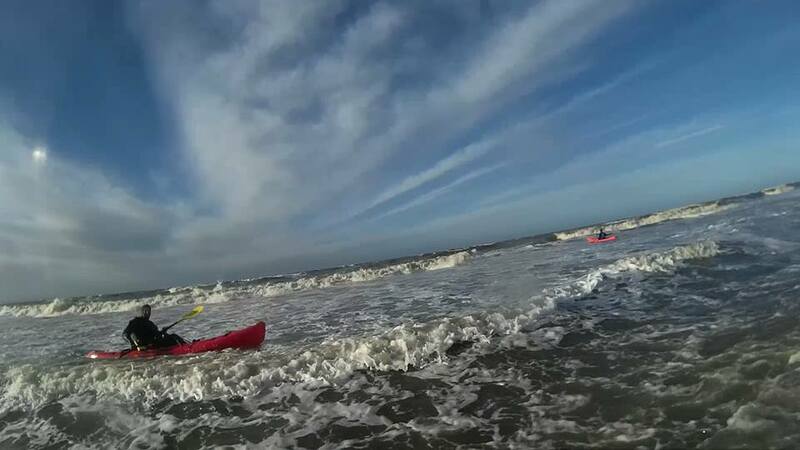 On the way back we discovered why the beach we launched from is not popular with kayakers — it dries out to about 500m. We couldn’t see our boats after the first time we walked back with a load to the car. That was Saturday. 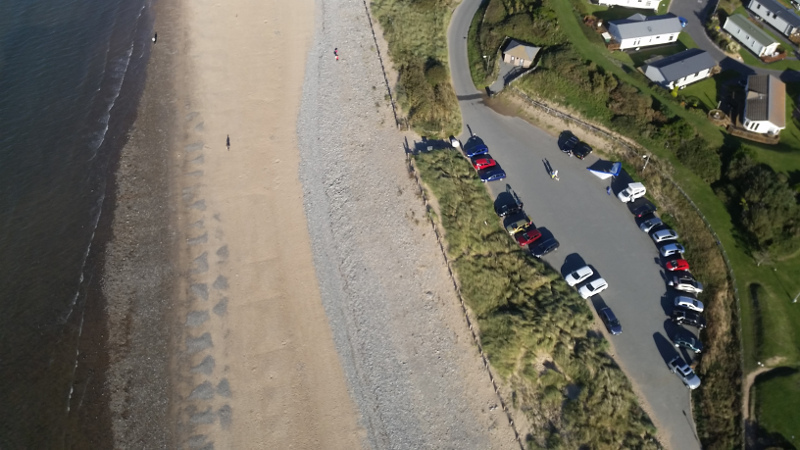 There was a pleasant day out at Moelfre, with some people being terrified of the currents, but it was the wash from the joy-riding lifeboats that nearly sunk us. The image of the almost breaking 4 metre high wall of water that came upon us while we were anchored in the shallows of Rat Island a few minutes after they zoomed through the channel is going to live long in my memory. The second dive worked out well when we found the remains of the Royal Charter in the sand after groveling in the shallows among the kelp where it was supposed to be until giving up. Then there was a cave trip to the far end of Ingleborough Show Cave (the only photo of which I have is a line of cavers getting changed on the footpath), followed by a quick escape home ostensibly to start clearing out the house, but which was in fact an excuse to be in North Wales for a flight off Penmaenbach. 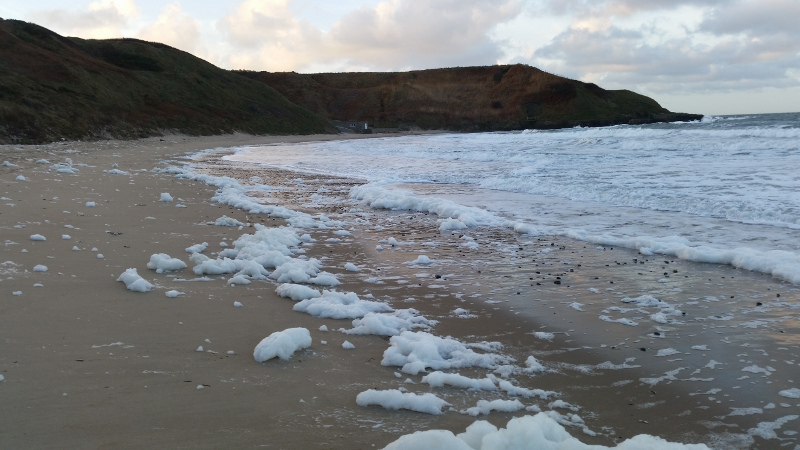 I landed on the dwindling beach at high tide after an hour of very smooth sailing in the sea air. 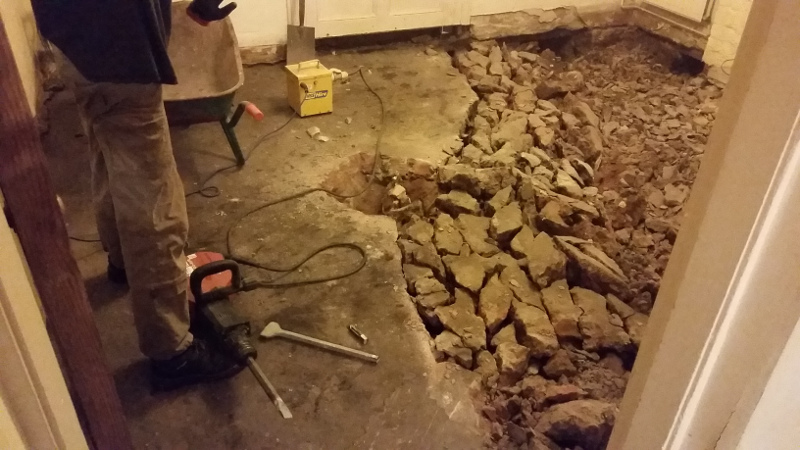 A concrete breaker was hired to smash up and take down the floor. We filled a skip with the crap a day later with some help from friends. Now we live in a building site. Again. And it’s mid-way through October. This one has been on our minds since we were caving novices in CUCC (back in 1987) when some of the big boys went to dive the sumps in Rowten Pot and had a bit of an epic. Twenty-nine years later Becka and I used the rigging put in for the Eurospeleo conference, took a small pony cylinder and checked it out. It was lovely with masks, warm hood, bright LED lights, proper wetsuits (much better than what they had in the bad old days). We went back and forth a couple of times without the tank, and then exited through Valley Entrance — with some complaining at the short pitch from the streamway, which I climbed out and she whinged at, in spite of the fact that she goes bouldering most weeks, and I don’t because I hate it. To distract myself on the underground camp of terror I stripped down my hang-glider logging device and took it down with a string of temperature sensors, barometer, humidity sensor and light cell and stuck it in a box in the corner with the string dallas temperature sensors extending out along the clothes line some ways from the tent. The tent was a home made affair designed to be light and sleep four people. The fabric was slightly water resistant. 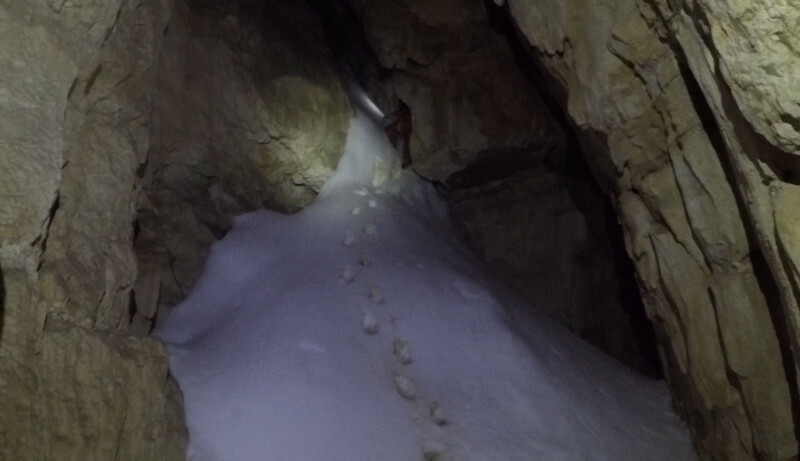 There was immediately a condensation problem with cavers waking up in the morning with the sleeping bags soaking. As a consequence people began leaving the front door to the tent wide open which meant that it was not a lot warmer inside than out. Key: The red vertical lines are in increments of 5 hours, horizontal lines are increments of 1 deg C (when applicable). Cyan lines are the temperature measuring devices, some inside and some outside. Cave temperature was around 2.9degrees, while inside the tent it got to 5degrees in the early part of the night. The four lumps of yellow on the lower line are from the light sensor and represent: (1) first arrival at camp and setting up the logger, (2) return to the camp after an afternoon of caving, (3) waking up in the morning, (4) returning back to the camp for packing up and leaving. 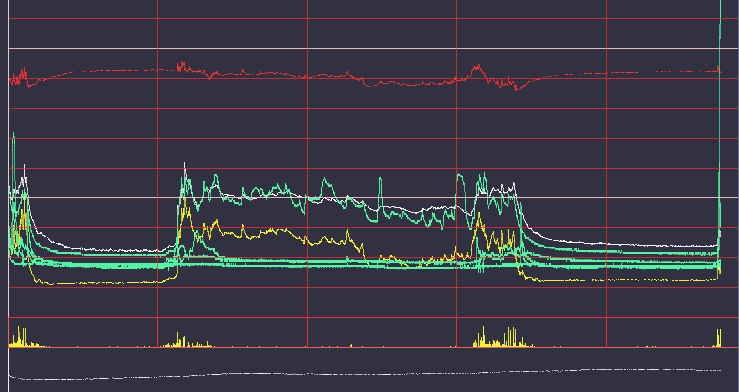 There is a sudden spike up in temperature when I dropped some of my spare clothes onto a sensor that I took off ready for the long climb out. The upper red trace is the humidity x 0.1 and varies between 95% and 88%. The middle white trace is the temperature logged by the humidity sensor itself. The lower white line below the zero is the barometric reading, which spends its time around 88000millibars corresponding to about 1200m altitude. Finally the yellow line is the dewpoint temperature, which varies between 2degrees and 4degrees. Some condensation was briefly encountered when we first got into the tent slightly sweaty (and the yellow and white lines crossed over). 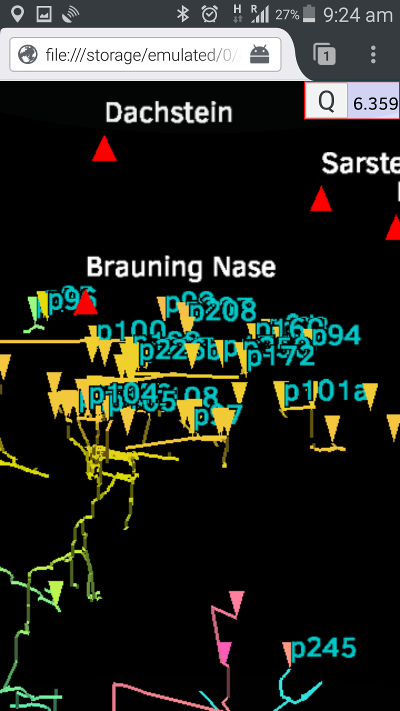 For the first half of the night the dewpoint temperature differential was at about 1degree. 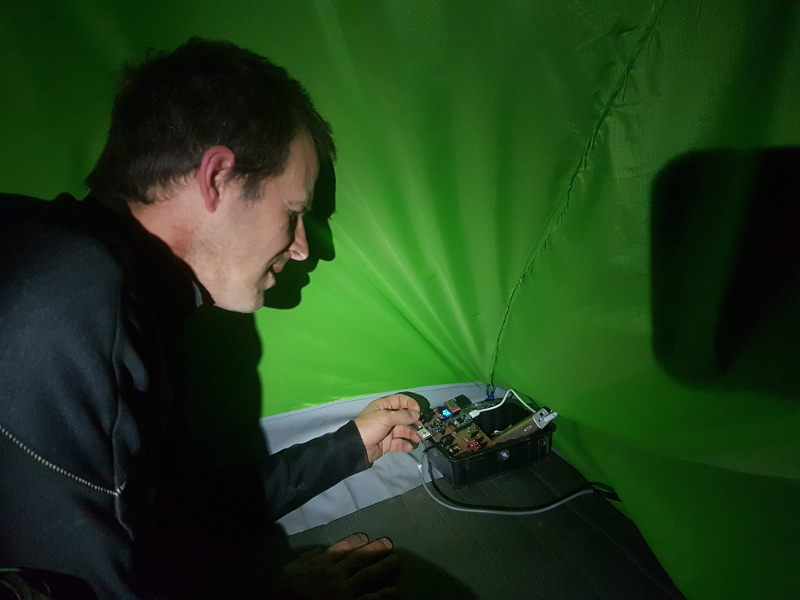 Then someone woke in the middle of the night and pulled the tent door much wider open which dropped the humidity by 2% and the inside temperature by 0.75degrees, but the differential widened slightly. I don’t know why the temperature varies so much during the night. Maybe it’s overall constant, but there are slight changes in convection currents that vary this. I should string the sensors all round the inside to see how it cross-varies. It takes at least an hour for stability to resume when we leave the camp. Humidity rises as the temperature decreases. Would the story have been different with a more porous tent fabric that could let out the water rather than one designed to be impermeable to liquids? If this was used we may have been able to raise the temperature inside the tent high enough to be clear of the dewpoint value, even though there is not much room below the 100% mark. There should be a calculation of number of breathing and sweating bodies, the inside temperature and the and rate of exchange of air that provides for an optimal size and location of vent holes for the night. However, it’s difficult to find anywhere in the world that is this cold, humid and miserable for any experiments. There are constant drafts around the cave which leave their mark in the rock formations. A set of barometers carefully synchronized, both outside and inside the cave, could produce an account of the total volume of the cave and its effective entrance surface area by modeling the flow of air molecules between these different reservoirs. This would tell you what percentage of the cave has been found. Experiments could be done on man-made tunnels whose dynamics are simple and volumes known. Higher frequency induced pressure changes might also be detected given that the bluefly is measuring at 50Hz. 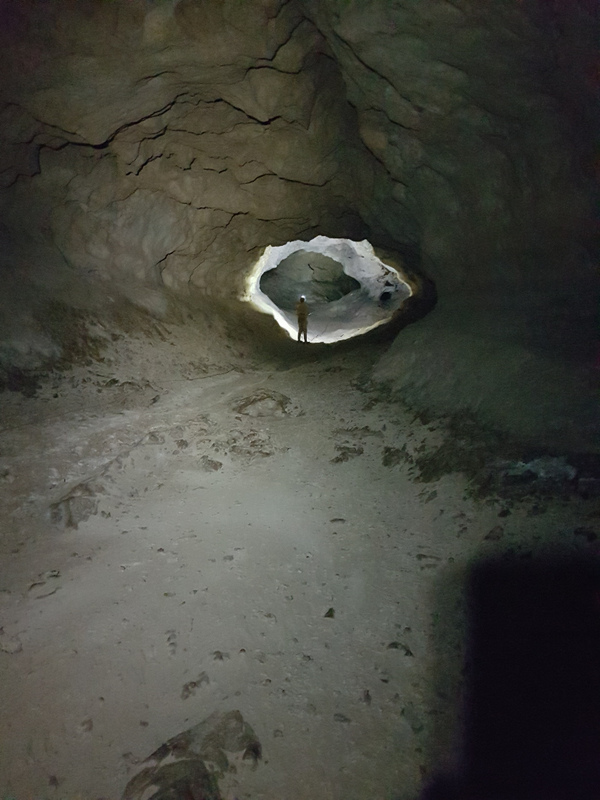 The weather turned caving, so I went underground two times. 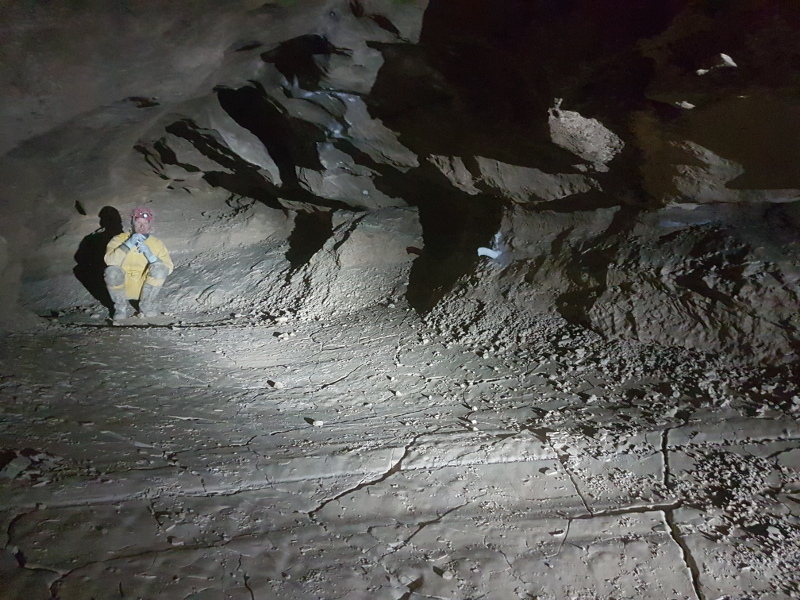 The first was to the shallow Balconyhohle (60m entrance pitch, then run around horizontal passages). There is a snow slope going up towards the surface that Andrew had a poke up. Then someone showed me a demo of virtual reality using WebGL on a smartphone in a webpage, and I spent a couple of days coding the obvious idea I’d had years ago of putting all the cave data into a 3D model, using the GPS position and screen orientation to project it so that your phone acts like some kind of X-ray vision through the ground. We used this to find a corresponding hole above the ground, which had a snow slope in it going down. It was a known hole in the database (identified by the metal tag drilled into the rock beside it) but with no record of exploration. Andrew looked at it the next day and couldn’t get down through. Later on he went underground again with a shovel and dug upwards as far as he could reach, but it still remained plugged. Maybe if we rigged up some kind of a shelter over the hole to stop more snow falling into it, it could melt out in a few years. Something like some metal bars and planks of wood higher up to keep the new snow from getting out of reach of the sun so that the spring meltwater pours down and erodes away a bit of the snow plug each year. 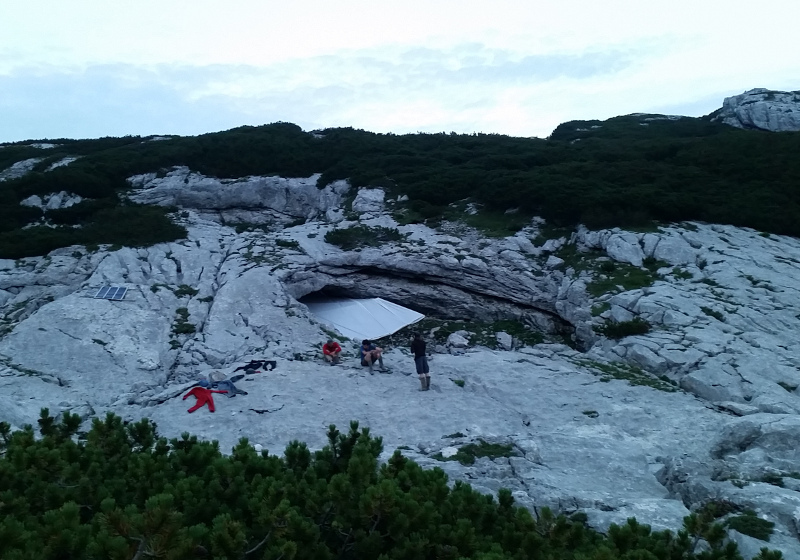 Then, because I didn’t want to do much caving, I decided to go on the deep underground camping trip, which was far, far too deep with a lot of nasty scary rope rigging on the way down and up that kept me in a state of terror for hours on end. This is not as illogical as it sounds. 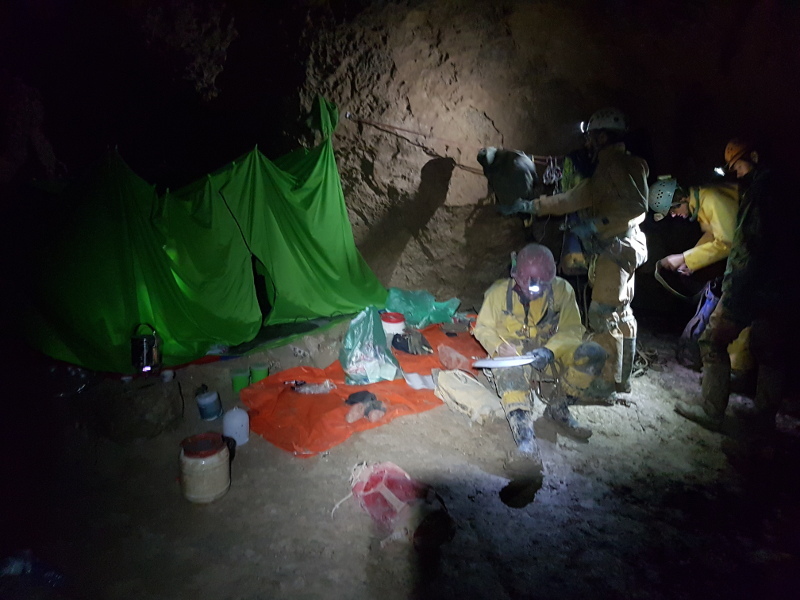 Caving is horrible, and it takes many days for the memory of how horrible it is to wear off (like the memory of a very painful hang-over) before I am prepared to do it again. But once I’m down there I haven’t got a lot of choice. Becka took her phone down to the camp (at -600m in Kraken chamber) and it took considerably better pictures than the fuzzy gopro I had. There was a cross-over with the previous camping group, which is why there’s so many people in this image. 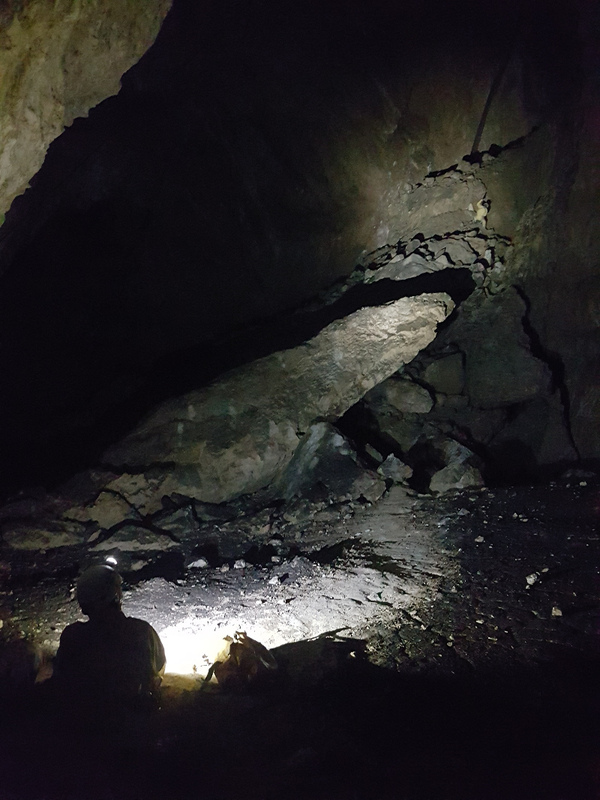 This is one of them starting up the big loose pitch out of the chamber, which begins with a 60m freehang, and then lots of rebelays on a blank rock above a soily bouldery slope that you keep kicking stuff down from. As a consequence only one person can be on the rope at a time and it takes ages. The passages were enormous and we explored and surveyed about a kilometer of cave. There were some surprising formations, including this pickled gherkin sized helictite with a drip on the end that never quite fell from it, because the mud was untouched below it. When we three finished our two days and one night stint, the next team came down and met us at the tent while we were stoking up on food for the horrendous climb out (lots of pathetic whimpering from me) and overdosing on our salt quota (according to the packet, the instant risotto meal for two I ate contained 11g of salt). Somehow on our ascent one of us pulled the rope up after us and accidentally hooked it over an isolated rock ledge well out of reach, which meant that this team were trapped underground until the full-expedition rescue was called out owing to them being overdue. Luckily, Becka and me were miles away in Griefenburg by this time, with her on her new road bike, and me playing in the low clouds. The sad thing was my favourite pizza joint in town had closed since last summer, and the restaurant we went to instead was a bit crap. Back at the expo the next day, Becka went straight up the hill while I attempted to get in another flight. 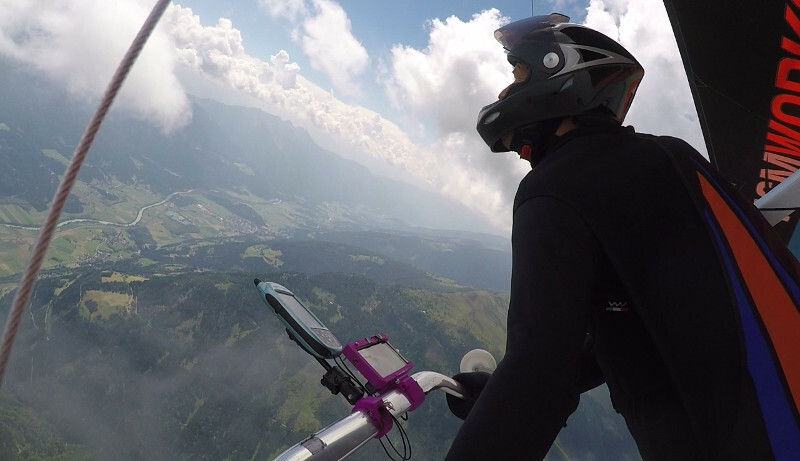 It didn’t go too well, and I nearly crashed off the ramp, probably because I’d kept the nose too high without a headwind to guide with wing position. I barely got away with it and haven’t dared look at the photos yet. Not good memories to leave this place with. I calmed my nerves for a couple of days by coding the groundwindow application and getting to know something about writing GLSL shader technology. It’s pretty stunning, and it makes the phone quite hot from all the computational power. 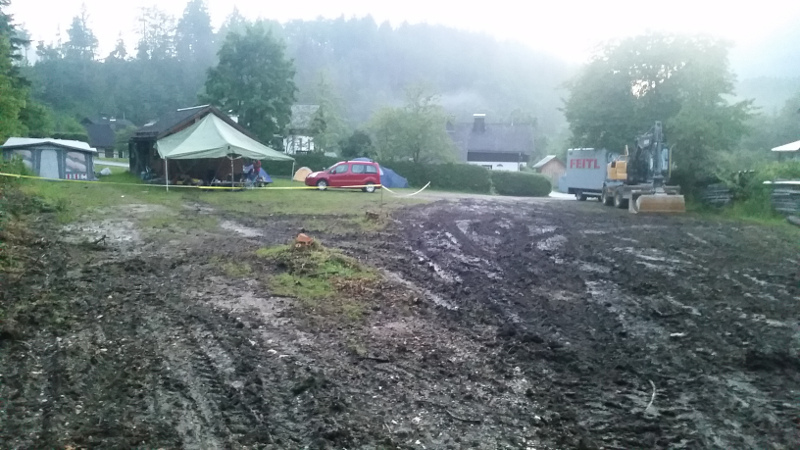 I cried at the state of the campsite in Austria when we arrived this year. It looked like part of the Amazon Rainforest — clearcut and still raining. The plan is to be here for about six weeks, and it’s not looking like a great idea. Only about a quarter of the people have arrived so far, and even the cordoned off area is pretty churned up. I pitched my tent on a gravel patch by hammering in nails to guide the tent pegs. So, to cheer myself up I did some coding, and wrote stl2png, a program to slice STL files directly into PNG images for use with an SLA printer. This is an example of a generated slice of the two chamber whistle someone has been printing a lot of in DoES. The team comprised of David, George and myself. Frank had found a new hole in the floor the day before and persuaded David to check it out. 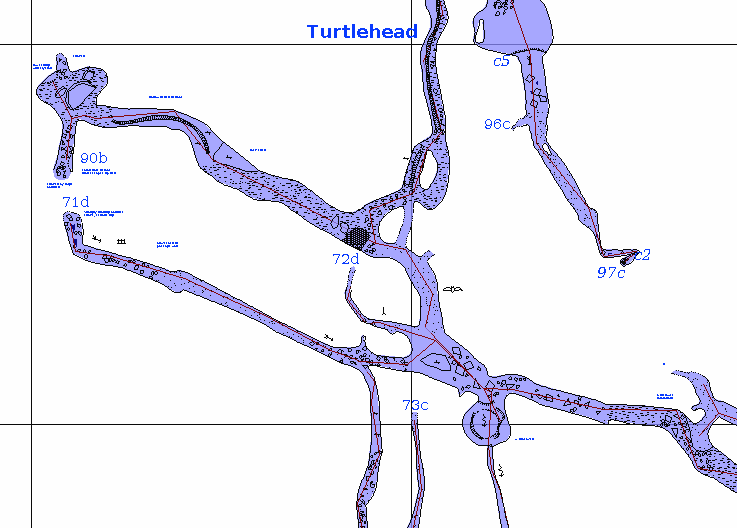 George and I went for a poke in the western extents in the direction of the Tunnocks cave (to which this one has not been connected yet). He found a moderately large unexplored chamber up there. I didn’t believe him because there was no echo, but I had to squeeze through anyway to check it out. We went back to fetch David who had so far only managed to push a big slab of rock over so it filled in Frank’s hole. He didn’t take any persuading to give up. We traipsed back to the drafting ceiling slot (tagged as “Question Mark 90b” in the database), pushed all our kit bags through, drills, tacklesacks of rope and ourselves, and began exploring and surveying it. Down one end there was a perfectly preserved dead bat spread out on the floor complete with wings and fur. David began drilling for bolts and putting in rope to get down the hole opposite to access the next level below. We ran out of time and came back the next day. Partway through the trip I finally got suspicious at how quickly George had been taking notes. David’s rigging had by then lead us down a rope and onto traverse line along a loose ledge above a bottomless pit to a proper passage. I lay down for a nap while David sorted out some of the missing surveys. I planned to bodge out a map of the chamber above. We carried on while David looked down the far end where there was a sandy slope with rocks embedded in the crest. He pushed one of them forward and it slid round the corner and carried on down. Back in the main passage with the high domed ceiling, George and I thought the world had ended with the entire cave imploding like a pile of boulders in a blender. I went rigid, unable to see any solid looking rock shelter nearby that I thought wastn’t going to burst into an avalanche. When the noise subsided, David didn’t know what we were yelling at him about, so we stood him exactly where we had been and then went and pushed one of the other boulders off the slope so that he too could experience the amazing sound explosion. I led him over and showed him where it was, now trodden on by a boot so that bits of wing and tail were spread over a wide area. It was time to go out. I came down the hill in the morning and typed in the survey data. It definitely doesn’t look right. There’s one huge rift passage which claims to coincide with an already known small passage. What a mess. This trip round the Lleyn followed on from last year’s Avoiding Nadilog by Walking in Wales. In retrospect nothing much happened. But it was exciting at the time due to the lack of planning and the risk of things going wrong. Departure was delayed till the morning of the 24th because someone couldn’t possibly miss their 14th digging trip of the year in ODB. Anyway it was raining and we weren’t packed yet. I’m going to do some other coding, now that I got this result. The code would fall apart if I touched it again. 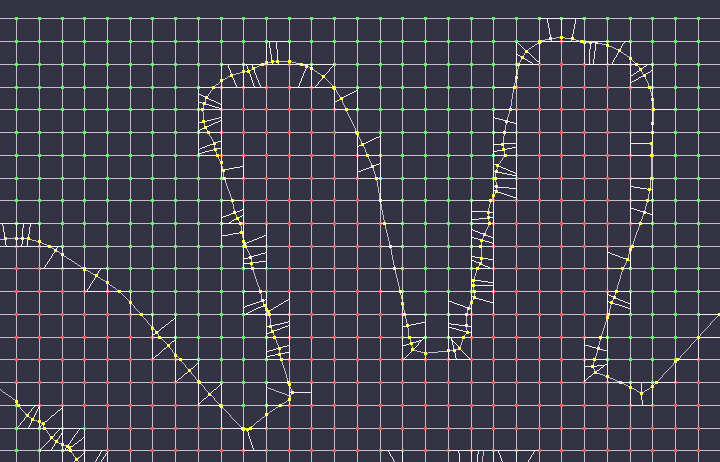 Next on the list of things to do is clear out the vast quantity of rubbish left in the code, completely redo the subdivision loops and make the logic robust, apply it to multiple z-levels and plot slices, then make it test against edges and faces (not just points), and package it into a self-contained (but very slow) version of the slicer. I don’t know how long this will take, as there are many other distractions available.